Hello dear readers! 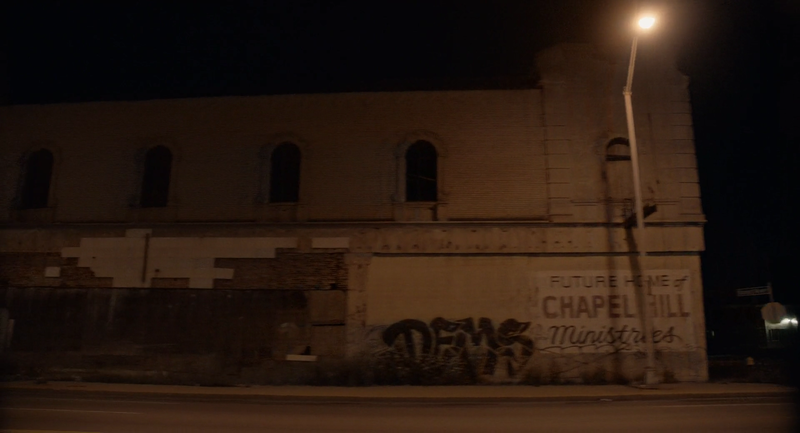 Welcome to the last instalment in my series of articles on Jim Jarmusch’s superb film Only Lovers Left Alive (2013), focusing on Jarmusch’s use of the gothic in the urban ruins of the film’s setting, the city of Detroit. This is the fourth and final article of the series, all of which have been adapted from a piece of academic writing submitted for grading to my University. I hope you all enjoy reading this as much as I enjoyed writing it. And by all means, please comment if you wish to debate any points – I encourage discussion! The film’s biggest question is whether a new culture, and therefore a recovered, vibrant Detroit, is possible. The biggest problem with a new Detroit music is that it is so explicitly based, at least within the film, on sounds that have already been heard. Not only this, but these sounds don’t really originate within Detroit itself – the gothic rock of Bauhaus came from the UK, the rock n roll of Elvis and Eddie Cochran from Memphis and Los Angeles respectively. This carries over in to real life too – Detroit musician Jack White draws on the Mississippi Delta Blues, not original to Detroit in any means. Ironically, the film 8 Mile (inspired by the life of Eminem) shows that any true Detroit artist simply has no room to be an artist in Detroit due to the mass economic failure. The film’s final scene shows Eminem’s character B-Rabbit walking off on his own, determined to forge his own path that will lead to an escape from Detroit, which is also the answer in Eminem’s own single “Lose Yourself” (recorded for the film), which features a much more biographical spin on the events of 8 Mile. Even in his book The Last Days of Detroit, Mark Binelli recognises that any arts scene is in its infancy, and mostly filled with coastal artists who have gone to Detroit for it’s ruinous space as a place of inspiration. Even the sudden launch and craze for Detroit techno was soon forgotten and relegated back to an underground movement. All of these case studies seem to show that a true Detroit music scene is hard to come by, and even when one is discovered there is inauthenticity about it or a desire to escape Detroit in the case of Eminem’s music. However, while Adam and Eve may take issue with the inauthenticity of the music, that doesn’t make it invalid. Indeed, Binelli notes that whilst the arts scene may be fostered by foreigners, or Detroit artists like Eminem may see artistic success as a method to escape Detroit, much of this music would not have been made without the presence of a culturally post-apocalyptic Detroit. As with any post-apocalyptic narrative, much of this space is about redefining what came before the apocalyptic event. In the case of the Detroit music scene, the inspiration from classic American narratives such as the blues or rock n roll, re-invented through the gothic in the case of Only Lovers Left Alive or garage rock in the case of Jack White, is an effort to re-invent these classic narratives in an attempt to capture the fall of Detroit – and it’s bounce back, should that ever happen. Indeed, it is only through working within the narrative frame of classic American culture that this rebirth can take place. It is through familiar narratives that these ideas are allowed discussion. Feet, fail me not, this may be the only opportunity that I got. And the big three killed my baby. Jarmusch does point to eastern influences in Tangier as a true original music, one that obviously captivates Adam when he sees Yasmine Hamdan perform. This may be inspiring from a Western perspective but does contain a shade of orientalist attitudes, and whilst it could help construct a new Detroitian narrative, it would be detrimental to Detroit. Ruins don’t encourage you to dwell on what they were like in their heyday, before they were ruins. The Coliseum in Rome or the amphitheatre at Leptis Magna has never been anything but ruins. They’re eternal ruins. It’s the same here. This building could never have looked more magnificent than it does now, surrounded by its own silence. Ruins don’t make you think of the past, they direct you towards the future. The effect is almost prophetic. This is what the future will end up like. This is what the future has always ended up looking like. Adam’s perspective makes him think that these ruins too are eternal, that nothing can save Detroit – this is what attracts him to the city, as an inspirational source for his own frankly morbid music. However, there are mountains of evidence that contradict his opinion. The government will not save Detroit due to lack of funding. Yet a citywide initiative, spurred by select members of the public, is doing its best to gentrify and look after Detroit. Whilst the city may be ruins, there is life in these ruins, life that wants to recapture and reignite the spark of society. Jarmusch’s film provides no certain conclusion to the question of a resurgent Detroit and an accompanying arts scene. The film does not have the historical distance from the time to be able to draw any stiff conclusions, and this isn’t what Jarmusch is interested in anyway. Only Lovers Left Alive seeks to document life in the ruins of Detroit, to question it, and to question the appeal of these ruins. Doing so through the use of the gothic and the vampire allows Jarmusch to use genre conventions to mediate this discussion. By setting up the city of Detroit as a gothic one allows him to frame the rebirth of the American music scene via the gothic. Furthermore his reinvention of the vampire and his / her relationship to the humans of Detroit allows him to comment on the state of Detroit. This allows for the final discussion of whether a new culture – and a new Detroit – is possible. Jarmusch doesn’t provide a clear-cut answer to this in Only Lovers Left Alive – he is more interested in day-to-day life than the more philosophical questions it poses. However, the hipster, snobbish side of Adam and Eve do fail to see the value in the re-interpretation of classic American narratives as a way to reclaim a sense of Detroit identity. Only by doing this can the people of Detroit forge ahead and rebuild their city. Binelli, Mark. The Last Days of Detroit: Motor Cars, Motown and the Collapse of an Industrial Giant. London: Vintage, 2014. Print. Pages 265-266. Eminem. “Lose Yourself.” Music from and Inspired by the Motion Picture 8 Mile. Shady Records, 2002. CD. The White Stripes. “The Big Three Killed My Baby.” The White Stripes. Sympathy, 1999. CD. Binelli, Mark. The Last Days of Detroit: Motor Cars, Motown and the Collapse of an Industrial Giant. London: Vintage, 2014. Print. Page 56. Dyer, Geoff. “How Detroit Became the World Capital of Staring at Abandoned Old Buildings.” The New York Times Magazine. The New York Times Company, 9 Nov. 2012. Web. 17 Aug. 2015. Binelli, Mark. The Last Days of Detroit: Motor Cars, Motown and the Collapse of an Industrial Giant. London: Vintage, 2014. Print. Page 54. I’d like to say thank you to the readers for taking time to read these past four posts – they’ve had some positive reception (I’m looking at you Matt Frazer!) and I couldn’t be happier about it. I’m hoping to make these “Reading…” articles a permanent part of Tales on the Border, so it was a thrill writing and preparing this first edition of it for you. I expect we’ll be seeing the next edition of “Reading…” in a couple of months. Until then I’ve got some articles and a new column starting soon. Once more, thank you for taking the time to read this far – I hope you’ll enjoy what I have planned for you!